With the Moose at your side, catering is a walk in the park! Our catering concierge and restaurant teams are 100% dedicated to ensuring your order is accurate and delivered on time. 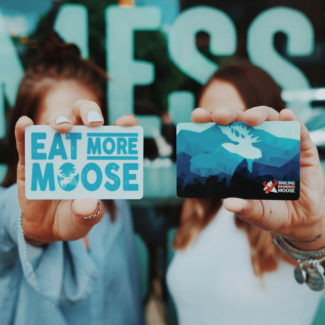 From freshly preparing your order in our restaurant to delivery directly to your office, event or meeting place; catering with the Moose is sure to make everyone smile, Eat Messy® and escape the ordinary one bite at a time. Call today to speak to one of our Catering Concierges! We don’t just cater your event. We cater to you. From family gatherings to work meetings and everything in between, our friendly, knowledgeable specialists are dedicated to creating the perfect event. Contact us with the details and we’ll take care of the rest! We’ll be sure to design the perfect menu, tailored to your needs. Good morning? How about great morning! Get your group started on the right foot with your choice of spreads: an array of delicious hot, hearty breakfast sandwiches and wraps, or a sweet and savory bakehouse selection of muffins, cinnamon rolls, pastries, and bagels and cream cheese. We also have a variety of juices, teas, and coffee–just ask! Recharge, re-energize, and reward everyone with our irresistible lunch and dinner spreads. Choose from a colorful assortment of sandwich & wrap trays, boxed lunches, family-sized salads, seasonal soups of all sizes, and scrumptious deli sides. All, of course, to be topped off with our sweetly satisfying house-baked desserts. We specialize in specializing! At The Moose, we want everyone to experience delicious flavor combinations, and that goes double for people with dietary restrictions! We offer a chef-inspired selection of vegetarian, vegan, and gluten-free entrees, including gluten-free sandwiches and salads, and we’re always happy to work with you. Just let us know how we can help! Unexpected? Rescheduled? Whatever the reason for your tight schedule, our friendly catering specialists will move mountains to make you the hero. Call us now!